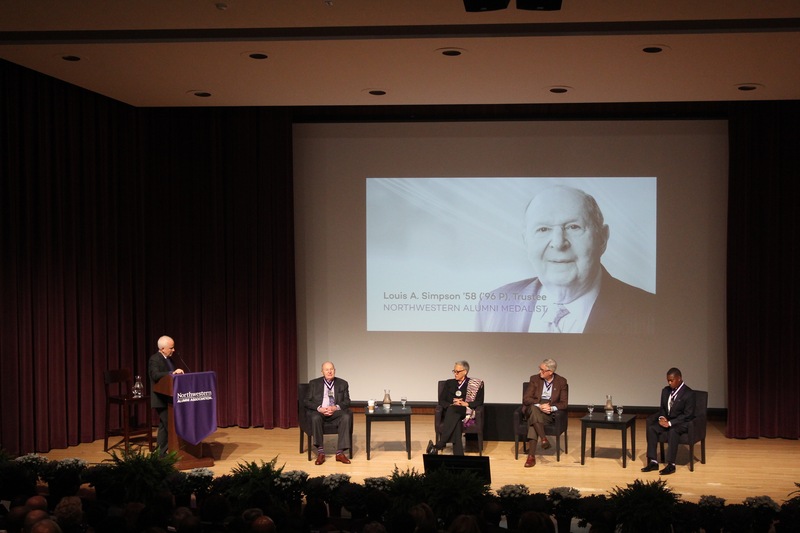 Northwestern President Morton Schapiro (left) prepares to introduce the 2018 Northwestern Alumni Medalists, among them trustee Louis Simpson ‘58, ‘96 P (right). The Northwestern Alumni Association gave its first medal, the group’s highest honor, in 1932. Schapiro begins to recognize Simpson, Johnnetta Cole ‘59 M.A., ‘67 Ph.D., ‘92 H, Douglas Conant ‘73, ‘76 MBA, ‘09 P and Courtney Armstrong ‘93, ‘97 J.D., MBA (left to right). 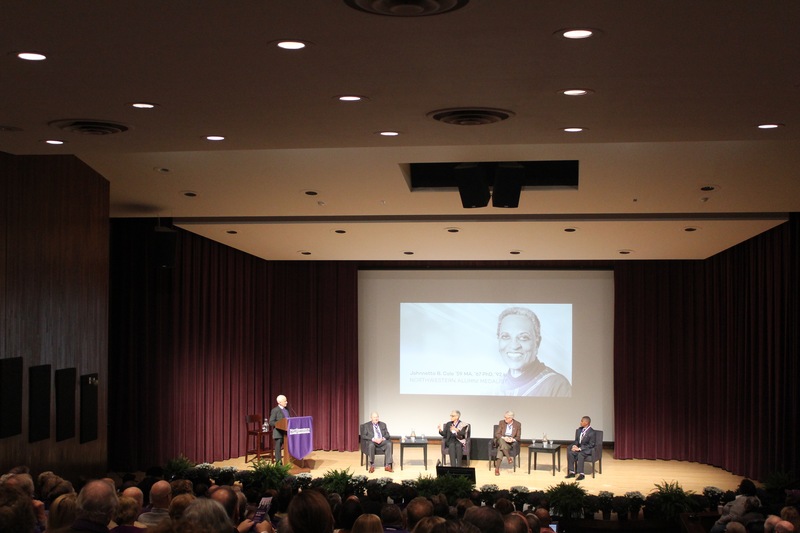 About 150 alumni and University officials attended the President’s Alumni Panel in Norris. Cole (center) discusses the importance of education, especially for minority students, and her own time as a 15-year-old college student at Fisk University, before attending Oberlin College and Northwestern. She was the director of the Smithsonian National Museum of African Art for eight years. 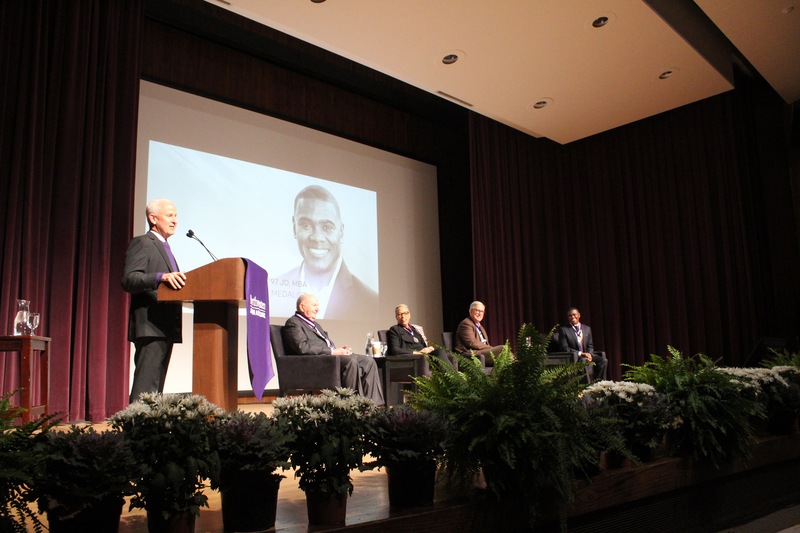 Conant (second from right) recounts his experience as a student athlete and how his time at Northwestern would help him in his future career as president of Nabisco Foods Company and Campbell Soup Company. 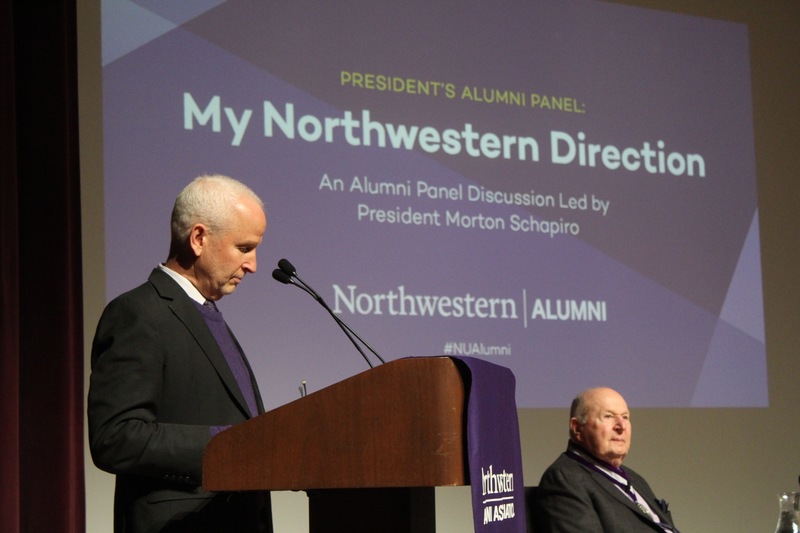 “Northwestern created these guardrails for me to go down the highway of life,” he said. 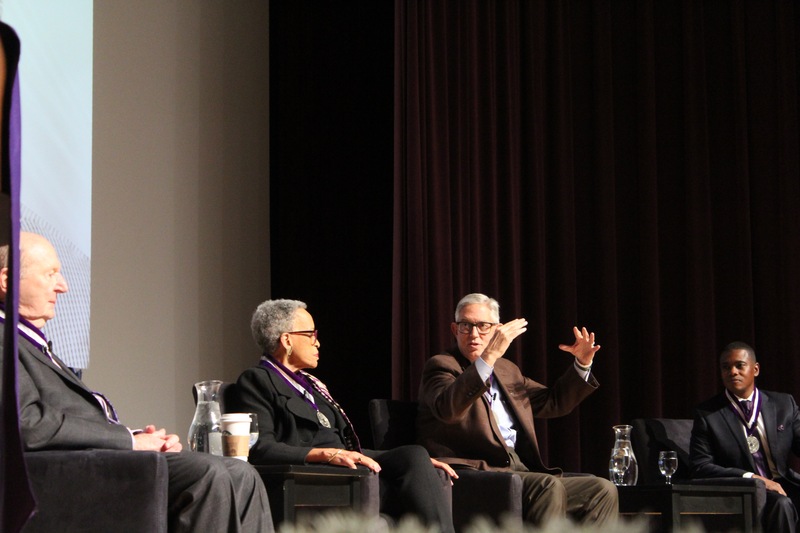 Simpson (second from left) shares thoughts on his personal connections to Northwestern, where he is a life trustee and adjunct professor. He retired as the president of GEICO Corporation in 2010 and currently serves as chairman of an investment firm. 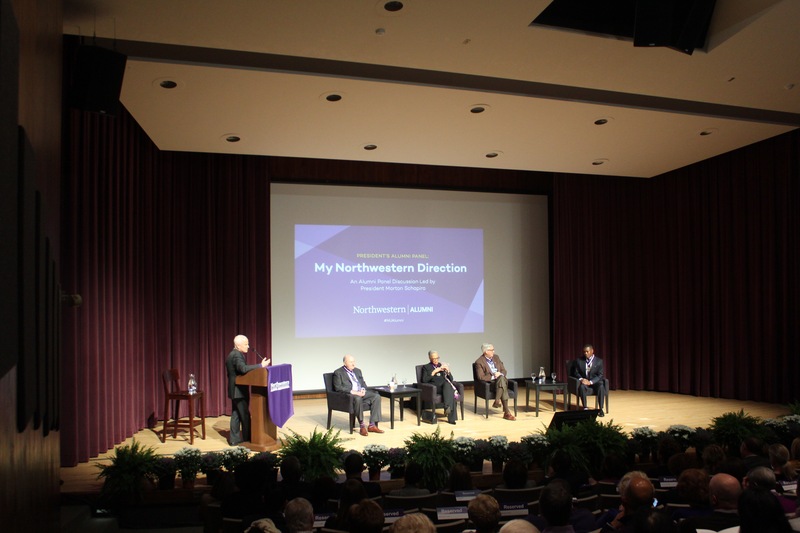 As part of Homecoming Weekend, Northwestern President Morton Schapiro moderated a panel discussion Oct. 12 with the 2018 Northwestern Alumni Medalists. This year’s recipients, who are tied to the University as undergraduate and graduate alumni and trustees, have emerged as leaders in academia, business and finance. All candidates for the honor must be nominated, and are selected for their commitment to impacting society in their careers, service to the community and support to the University.